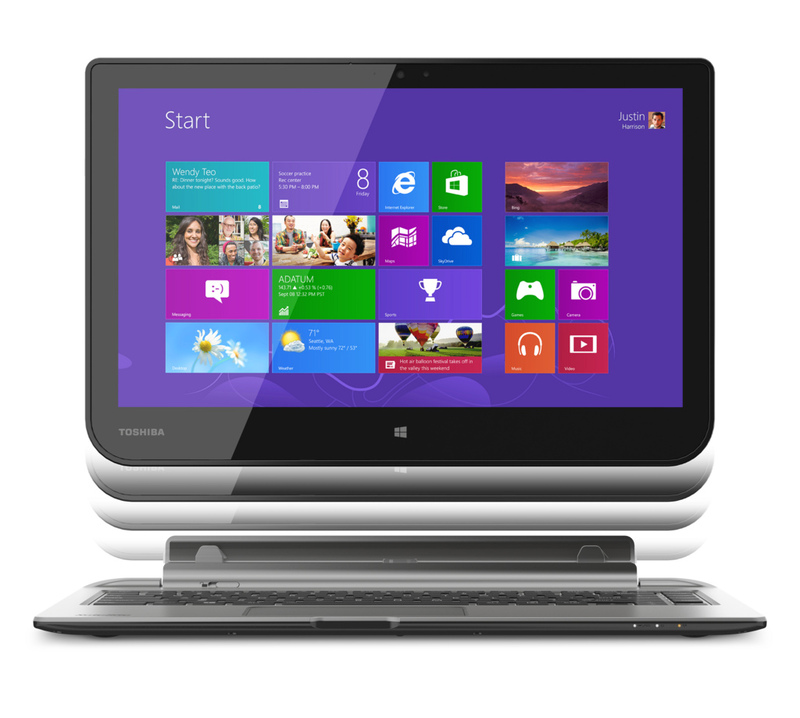 Toshiba's Satellite Click is the first detachable device to use AMD's Temash APU. 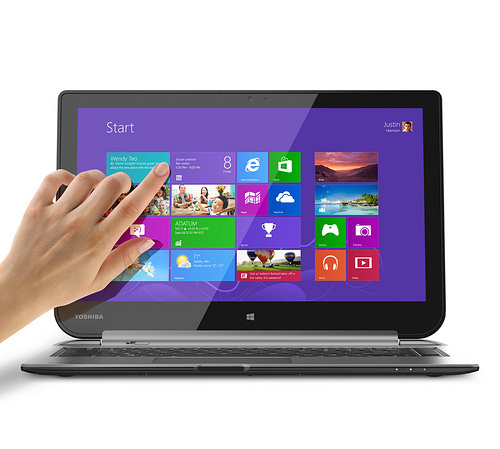 This 13.3-inch ultrabook offers both tablet convenience and laptop functionality in a single package. 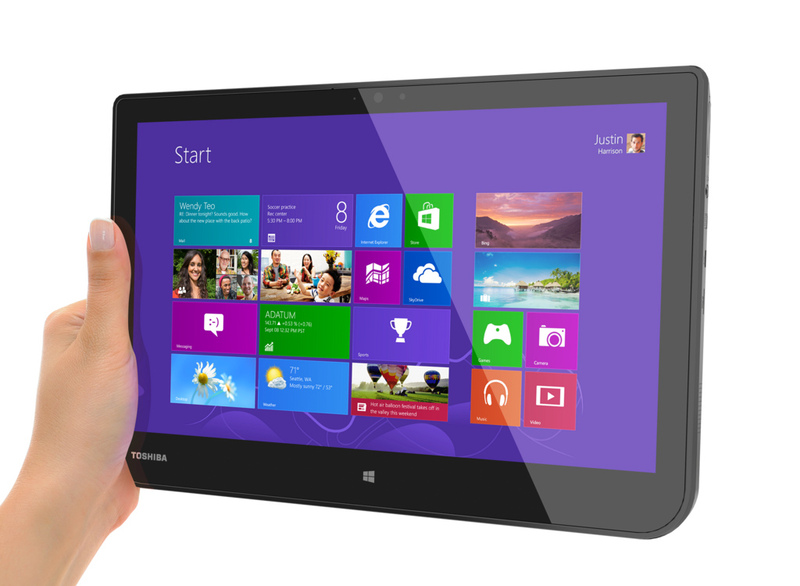 Toshiba today announced the arrival of its first device to use an AMD Temash APU. The Satellite Click 13.3-inch notebook is a hybrid that features a detachable keyboard/dock and a removable touchscreen tablet. While most competitors announced tablet/notebook hybrids powered by Intel, Toshiba made a bold move and decided to use an AMD SoC. This decision may prove to be a smart one, given the price/features ratio offered by the Satellite Click. 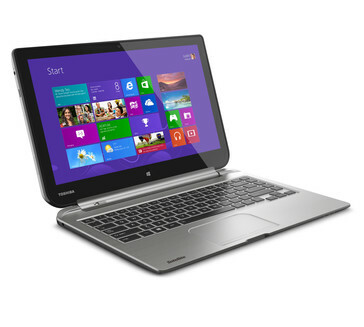 In addition to the above, the Toshiba Satellite Click also features a webcam and a dual-battery setup that supports DC-in on both the screen and the keyboard base. 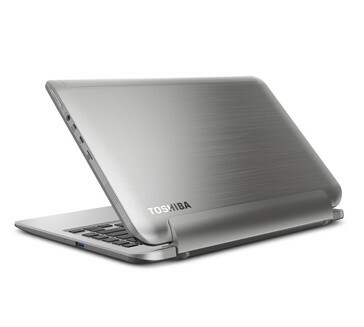 Its silver casing and fanless design also make it a very attractive choice at a price around the $600 mark (not confirmed by Toshiba yet). The Satellite Click will be available later this month exclusively through Best Buy (online and in stores) and Toshiba Direct. New detachable design with a 13.3-inch diagonal IPS multi-touch screen delivers two form factors in one device – a laptop and a tablet. Powered by the AMD A4 Accelerated Processing Unit with AMD Radeon™ 8000 graphics performance. 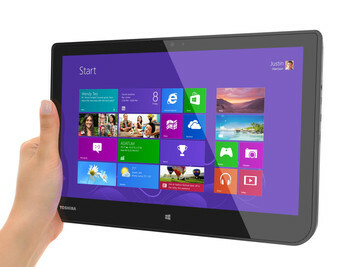 Key hardware features include a 500GB hard drive (built in to the removable tablet) and dual battery design. Sold exclusively via Best Buy and Toshiba Direct for the Holiday 2013 buying season. IRVINE, Calif.—September 5, 2013—Toshiba's Digital Products Division (DPD), a division of Toshiba America Information Systems, Inc., today announced the Satellite Click™, an all-new detachable consumer PC, offering the full functionality of a Windows 8 laptop with the convenience of a tablet in one portable device. Designed with a removable 13.3-inch diagonal touchscreen tablet that locks and unlocks from the hinge, Satellite Click offers a seamless transition between laptop and tablet modes. The Satellite Click is available exclusively via Best Buy and Toshiba Direct for the Holiday 2013 buying season. The first detachable device to utilize AMD's low-power A4 accelerated processing unit2 (APU), codenamed "Temash," with AMD Radeon 8000 graphics3 and 4GB of 1600MHz DDR3L RAM4, the Satellite Click delivers fast, laptop-class dual-core performance while maintaining a generous battery life rating. A 500GB hard drive5 is built-in to the removable screen making it easy and convenient to store files, photos and media libraries on the same device used for travel. 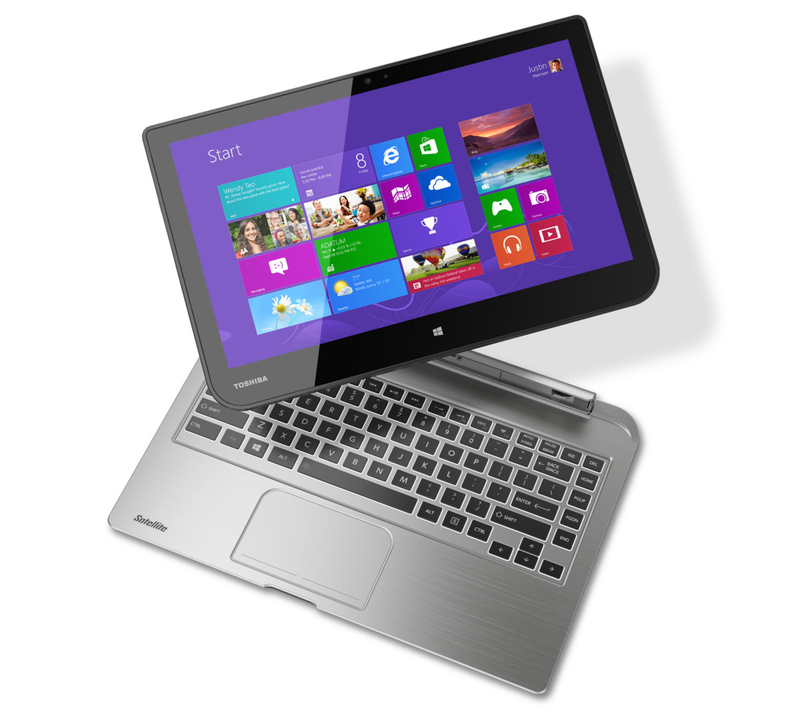 Tablet essentials, including a built-in webcam, Micro USB 2.0 and HDMI® ports, a microSD™ slot, plus accelerometer and gyroscope sensors, enable the device's transformation from laptop to tablet without compromise. "The first generation of detachable PCs was out of reach of the mainstream buyer," said Carl Pinto, vice president of marketing, Toshiba America Information Systems, Inc., Digital Products Division. "We believe that home users can truly benefit from the form factor as it provides the versatility for both work and play. We paid attention to every detail with the Satellite Click, equipping it with the right processor, ample storage and a larger-screen tablet at an attainable price." "Our latest APUs are designed to address the needs of new and traditional mobile PC users who want an amazing visual experience," said Bernd Lienhard, corporate vice president, AMD Client Products. "We worked closely with Toshiba to incorporate the new, power-efficient AMD A4 APU on the Satellite Click that combines stunning graphics and excellent CPU performance, while maintaining impressive battery life." The detachable design of the Satellite Click enables a seamless transition from productivity to play, delivering the horsepower needed for both content creation and consumption from one, highly-portable device. 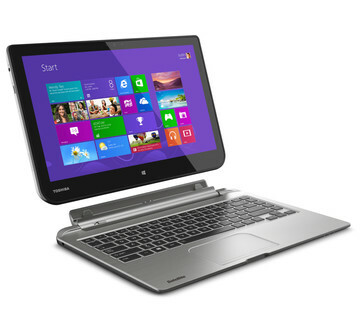 The device features a hinge design that allows the screen to be removed completely or tilted up to 125 degrees when in laptop mode. A dual-battery set-up supports DC-in on both the keyboard base and on the screen, giving the user the flexibility to charge while docked or undocked, while a smart approach to charging prioritizes the removable screen to receive a charge first. The keyboard base consists of a full-size keyboard and touchpad along with a USB 3.0 port with Toshiba's USB Sleep & Charge technology . The device is enclosed in an attractive silver casing with a sleek fanless design for a clean, elegant look whether it's being used as a laptop or a tablet. The Satellite Click will be available beginning September, 2013 exclusively at Best Buy stores, BestBuy.com and ToshibaDirect.com. 1. Display. Any small bright dots that may appear on your display are an intrinsic characteristic of the thin film transistors manufacturing technology. 2. Processor. CPU performance may vary. 3. Graphics. GPU performance may vary. 4. Memory. Memory size may vary. 5. Hard Disk Drive Capacity. Hard drive capacity may vary. 1 Gigabyte (GB) means 109 = 1,000,000,000 bytes using powers of 10. 7. USB Sleep & Charge Function. May not work with certain external devices even if they are compliant with the USB specification. In those cases, turn the power of the computer ON to charge the device.